The 4th of July is just around the corner! 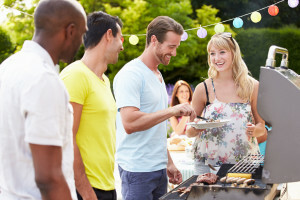 Whether you are hosting a backyard barbecue or poolside party, you probably want to set it apart from the slew of standard patriotic celebrations. Fortunately, there are a few easy things you can do to take your social event to the next level. To make the most of your celebrations over the holiday weekend, use these 4th of July party tips. Generate A Garland: Want your party to be filled with red, white, and blue and still look unique? Buy red, white, and blue plastic tablecloths and cut them into 4 inch by 3 foot strips. Tie these strips around a set of string lights (just make sure the lights do not get hot) to create a beautiful garland that will give your party a glow. Give Out Goody Bags: In flat cellophane gift bags, pour a handful of blue M&Ms. Lay the bag flat, then slide in strips of Cookies ‘n’ Cream chocolate bars and licorice to create alternating red and white strips. Voila! The perfect little flag goody bag. Set Up A Soda Bar: Buy some red, white, and blue (Jones Soda makes blue options) sodas and set them out with bowls of cherries, whipped cream, vanilla ice cream, striped straws, and other fun toppings so your guests can make their own delicious and patriotic sodas. We hope you have a great (and safe) time celebrating! Does hosting this party remind you how much you want to get into a home with most space for hosting other events? If you are on the hunt for the right California home to hold your happenings, contact John & Michelle. Serving Chino Hills and the surrounding California area, we can help you find the perfect home for your lifestyle.